Kirkenes is the last outpost town of north-eastern Norway before the border with Russia. As such it was a particularly sensitive place during the Cold War. And before that its gateway position, ice-free harbour and proximity to various coal and nickel mines made it a hotly contested target in WWII between occupying Nazi Germany and the USSR as well. Local museums cover both of these aspects today. More background info: Kirkenes is a remote place, the easternmost town in Norway and high above the Arctic Circle. Despite its remoteness it is a strategically important location – due to a largely ice-free harbour with access to the Barents Sea. Thus it was held by Germany as part of the occupation of Norway in WWII – and during those years it saw an unusually large number of air raids. It was also the first place to be recaptured by the Soviet Red Army in 1944 – at a time when the Germans were retreating, leaving behind "scorched earth" as they went. Almost all of Kirkenes was destroyed. During the Cold War era, this was the only area in Europe where the Soviet Union and a NATO country shared a direct Iron Curtain border. (And the only other stretch of it where the USSR faced a NATO member directly was the border between Turkey and Armenia – see Ani and Ani viewpoint & Iron Curtain). 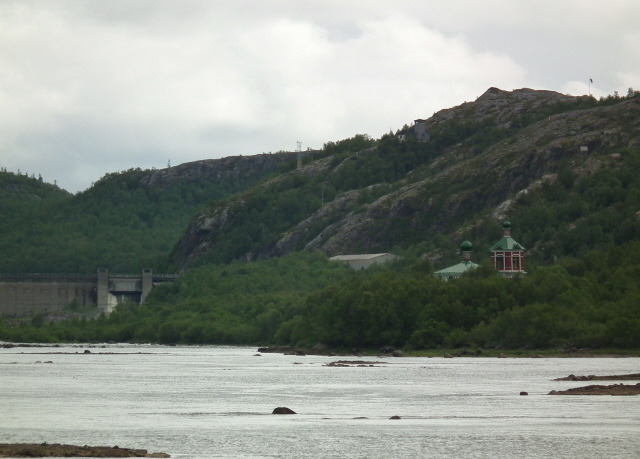 Today, with the Cold War over, Kirkenes also serves as the gateway to north-western Russia, especially Murmansk. In fact, the proximity of Russia also shows in Kirkenes itself: street names are given in both Norwegian and Russian, there's a weekly Russian market and lots of Russian boats, both fishing vessels and icebreakers use the ice-free harbour of Kirkenes. Thus there are also many Russian sailors in Kirkenes. Otherwise Kirkenes is just a provincial little Norwegian "hub", not exactly attractive architecturally, but pleasant enough for a couple of nights to serve as a good base for explorations of the area and for excursions beyond. The border with Russia is also a dark-ish attraction of sorts in itself. 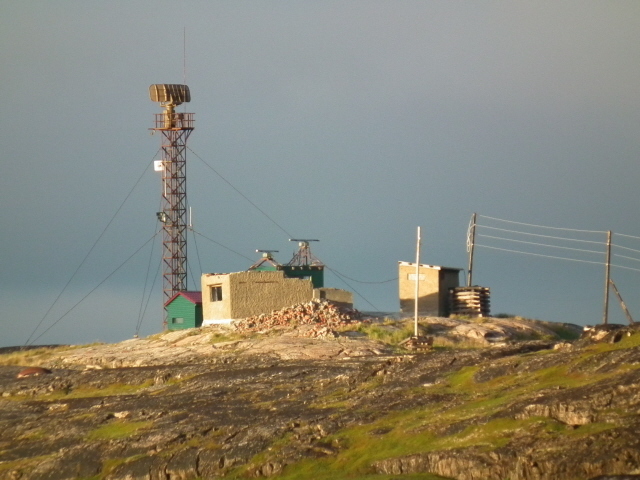 It is regularly incorporated into the popular king crab safaris (see below), some of which go as near to the Russian Boris Gleb as is legally possible, namely to a special hut right behind the border markers. While you wait for the king crabs to be prepared you can stand just metres away from Russian soil – only crossing that line is absolutely illegal. The many watchtowers you can see on the hillsides are manned so any wrong step can potentially be observed by border security. And the fines for misbehaviour at this border are hefty! So do obey the rules. If you actually want to cross that border you have to have a Russian visa and must use the proper border crossing points. One of them is just a few miles east of Kirkenes. 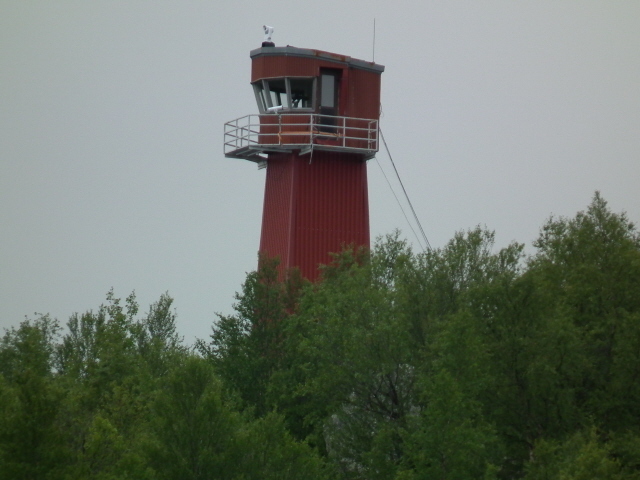 It's the border post used when going on an excursion to Murmansk. Otherwise you have to be content with just seeing the border. At the end of the road, Western Europe also ends. You can look out over the Barents Sea … next stop north from here is the Arctic proper. If you sailed straight up you'd pass between Svalbard and (Russian) Franz-Josef-Land and would get to the North Pole. To the east, at the very north-western end of mainland Russia on the other side of the border river's mouth, you can see the Russian border post with radar equipment and aerials. The Norwegian equivalent towers high up on a rocky hill. This is where a NATO territory ran right up to a Russian part of the old Eastern Bloc border. In fact this was the only stretch of border anywhere in the world where the heartland of the Warsaw Pact, i.e. 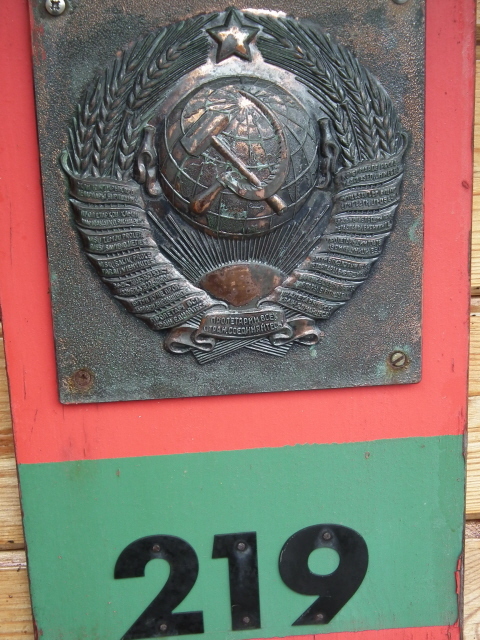 the Russian SSR (see Soviet Union), actually was physically adjacent to its enemy's land. Today it still remains a sensitive border, but things are much more relaxed, atmosphere-wise. I chatted to some Norwegian border soldiers and they said they even volunteered (or rather: eagerly applied) for being posted here during their conscription time. It is indeed an especially beautiful piece of remote wilderness up here. 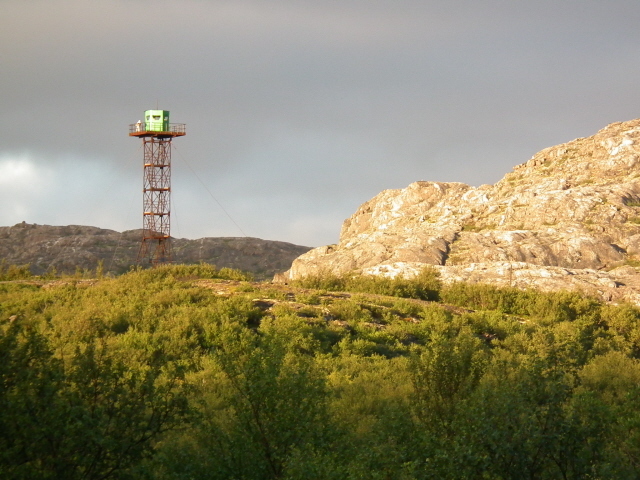 Placed rather incongruously right at this remote border location is the Kong Oscar II chapel – a stone church specifically erected here by the Norwegians as a kind of border claim marker in its own right. An odd kind of statement it may have been to invoke God and heaven in territorial claims, but it's certainly one hell of a scenic location for a chapel! 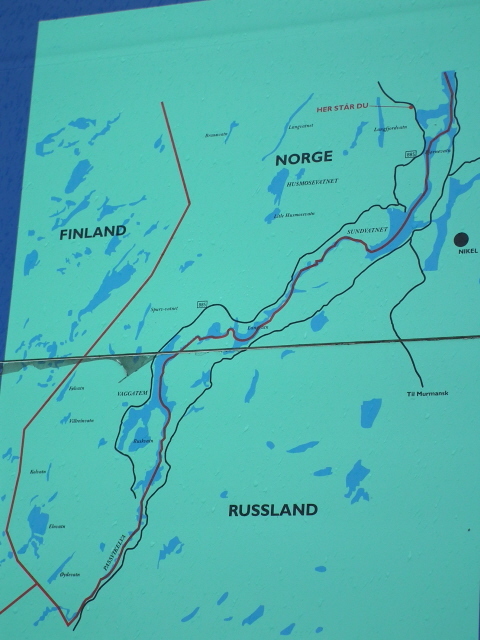 To the south of Kirkenes there's the Lapland wilderness of the Pasvik region, which also straddles the border with Russia, as well as with Finland. 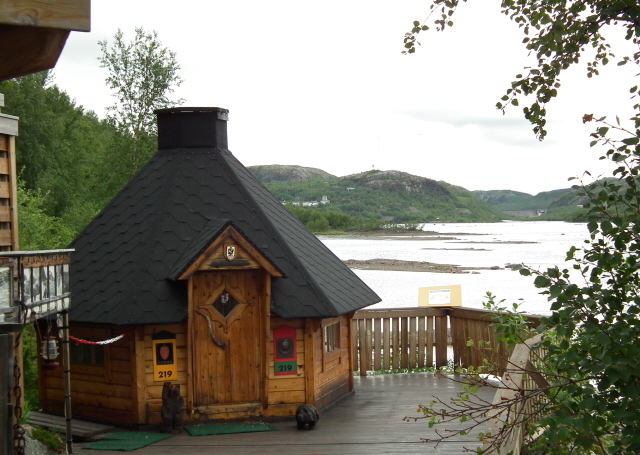 In fact this is Sami country, and a couple of rural museums take that aspect of Sami culture in too. For the dark tourist, however, this part of the former Iron Curtain border is somewhat less attractive than the one at Grense Jakobselv. 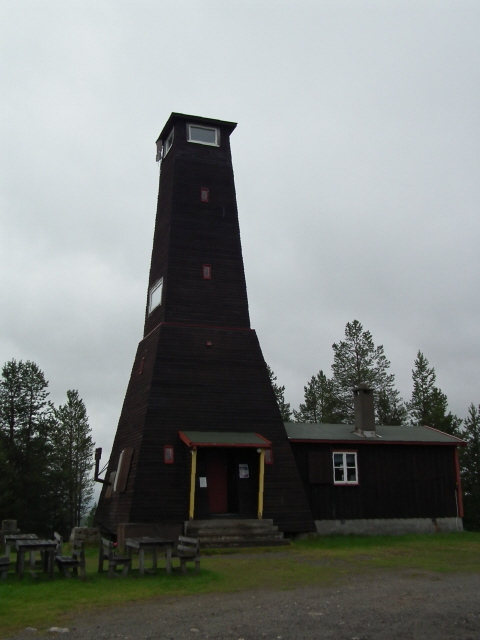 One exception may be the watchtower at "Høyde 96". From here you can look across to the Russian side and on a reasonably clear day can see as far as the pollution-belching chimney stacks of Nikel (see under Murmansk). Normally you should be able to climb to the top of the tower, but when I was there in early August 2012 it was closed for renovation. Hopefully by the time you read this it will have reopened. 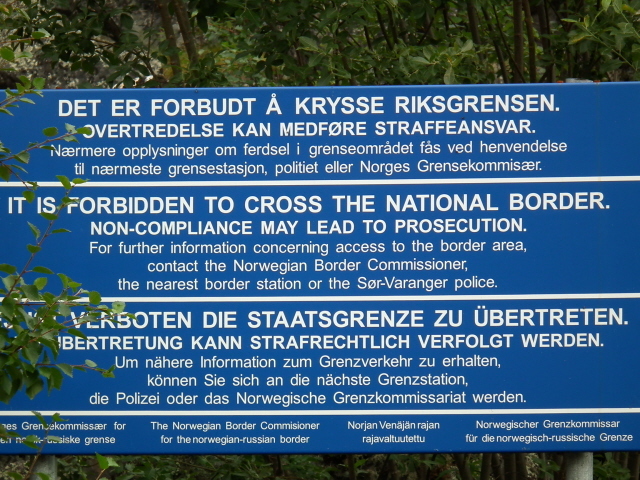 All along this border region do respect the signs pointing out the rules of behaviour – which includes restrictions on photography (no lenses longer than 200mm), prohibition of any kind of making contact across the border, let alone crossing over the border line anywhere (even though it would be quite easy in some places). 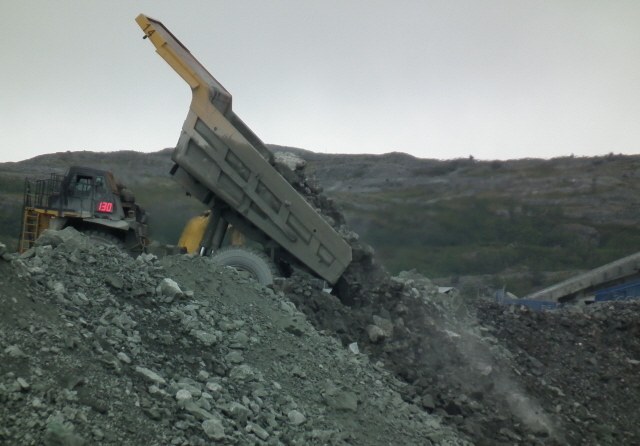 Those with a certain liking for industrial wastelands (like myself) may also enjoy a side-trip to Bjørnevatn and its open-cast iron-ore mine where you can observe some typical big-scale machines going about their work. But you can only do so from the sidelines, as it were. Access to the mine itself is not allowed. At the entrance to the village, opposite the big supermarket, spot the odd bus shelter … fashioned from an upside down massive mine shovel, big enough even for someone as tall as me to stand under! From the mine a short train line leads to Kirkenes harbour and its large iron-ore separator plant and loading facilities, which, again, are only viewable from a distance (and are less impressive than the complex at Narvik). The rest of the harbour is not so interesting. Nor is the town centre as such. Given it was almost 100% flattened in WWII, it's not a big surprise to find that virtually all buildings are rather bland and uninteresting. But staying in town is not what you'll be here for anyway. It is ultimately the location of Kirkenes that is its greatest asset – and not just as the terminus for the Hurtigruten line. 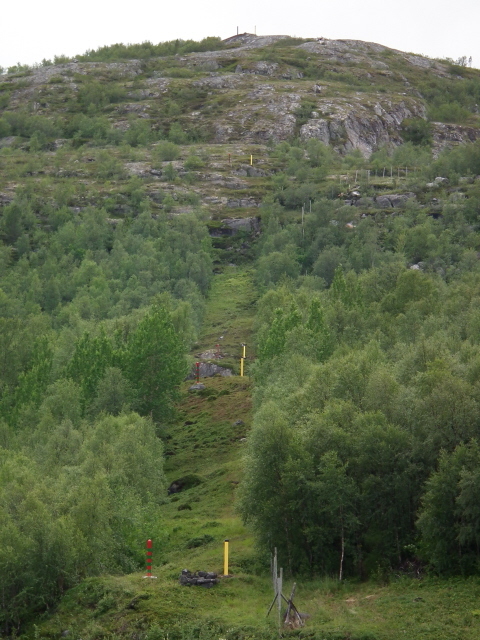 Location: in the far north-eastern corner of Norway, just a few miles from the border with Russia's Murmansk region. Murmansk city is ca. 100 miles (160 km) away, the next bigger place within Norway is Tromsø, some 300 miles (500 km) to the west (450 miles or 750 km by road). 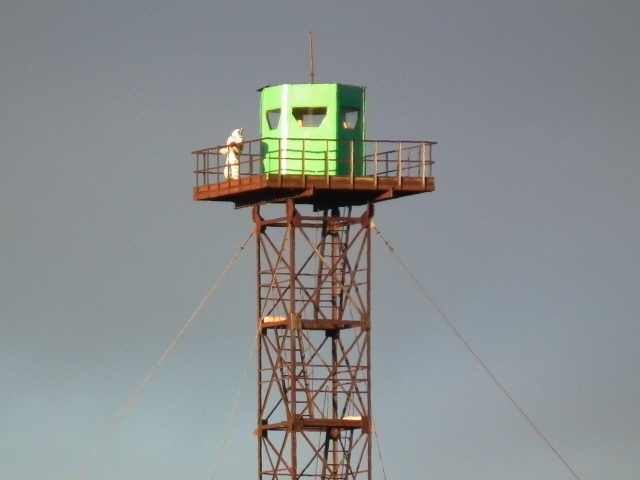 Boris Gleb and the border crossing point on the road towards Murmansk and Nikel are ca. 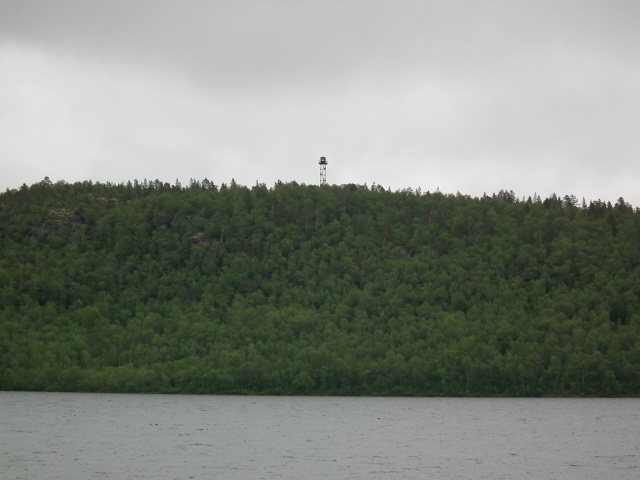 8 miles (13 km) south-east of Kirkenes. The road to Grense Jakobselv branches off to the left just before the border and takes about an hour to drive each way. Høyde 96 on the road into the Pasvik region is some 24 miles (40 km) south of Kirkenes. Bjørnevatn is the first village less than two miles (3 km) south of the main intersection of the Pasvik road with the E6 and E105 (Murmansk road). Access and costs: very remote but not difficult to get to; tours and most accommodation options are on the expensive side (even by Norwegian standards). Details: Kirkenes may be very remote but it's a lot easier to get there than you might expect. The most easiest way in is by plane (see under Norway in general). Kirkenes airport is served by several domestic airlines, including the budget carriers Wideroe and Norwegian Air Shuttle. There are regular airport shuttle buses to/from Kirkenes. Another very common form of transport to this exotic spot, however, is by boat – as it is the terminus of the famous Hurtigruten cruises. Going all the way from Bergen, however, takes a whole week. The E6 also ends here, which is the main trans-Norwegian road (which goes all the way down to Oslo and beyond to Malmö in Sweden). So it is possible to drive up here – though, again, you'd need a lot of time for this, given the distances. Organized excursions to Grense Jakobselv and down to the Pasvik area are offered by coach on certain days of the week from Kirkenes. But it's much better to hire a car and do it independently to avoid the crowds and in order to be able to stay anywhere for as long as you like. Car hire is of course expensive in Norway, in particular if it's only for a day, but in this case it's hardly more than the prices charged for those coach tours, so it is worth it for the added value. You can get a hire car straight from the Tourist Information Office on Parkveien by the main square. The charge I had to pay was something like 1000 NOK. Hefty, for sure, but worth the investment. After all if you've made it all the way up here you don't just want to hang around in drab Kirkenes town centre! 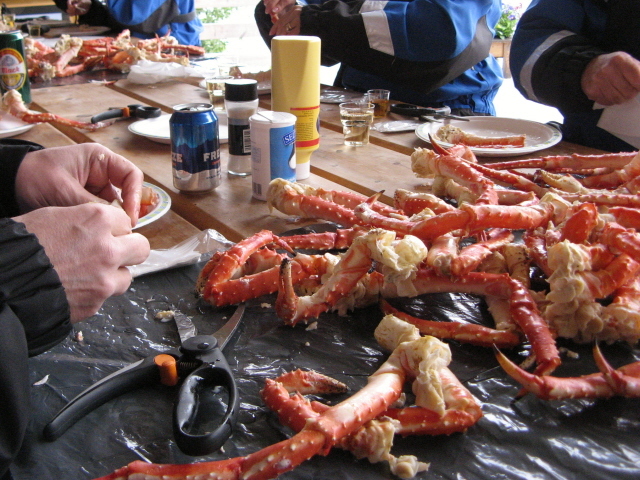 The king crab safaris are offered by a number of operators. Some go by inflatable speed boat, at least one even adds the special treat of a midnight sun dip in the icy waters of the Barents Sea. The one I used was in a slender wooden boat that went up the Pasvik river to a spot just opposite Boris Gleb over on the Russian side. The king crabs "harvested" en route in Kirkenes Bay were boiled up and served in big heaps of legs on a long wooden table by a hut that sits just metres away from the border marker poles. The crab comes with condiments but is best enjoyed plain. Drinks are included too (even wine – a very unusual and valuable perk in Norway … shame I had to drive and couldn't make use of this rare treat!). None of these tours are cheap either (nothing in Norway ever is), but if you consider what you'd have to pay just for such an unlimited amount of tasty king crab legs anywhere in the south or at home, then the price of ca. 900 NOK doesn't seem quite so steep any more (see below for more details). Accommodation options in Kirkenes are more plentiful than might be expected for such a remote location. The standard tourist hotels are a bit more expensive than elsewhere here, while the more budget-friendly places can be rather basic (and one is primarily used by Russians). When going for one of the hotels of the Rica chain, make sure to pick the newer one right in the centre (which also has a good "Arctic Menu" restaurant), rather than the older one on the southern edge of town. The latter, however, is very near the Grenselandsmuseet …(but there is nothing much else of interest nearby). Time required: The border museum and Andersgrotta could be done in a single day, but if you also want to explore the region a bit and maybe do one of those king crab safari boat tours to the Russian border, then an extra day or two are advisable, also if you want to use Kirkenes as a base for a return excursion to Murmansk. Combinations with other dark destinations: Apart from the few sights in Kirkenes itself and in its surrounding lands, one main draw for coming out here is to use it as a stepping stone to Murmansk. Indeed, other than travelling north to that exotic place from within Russia (e.g. by train from St Petersburg), going by bus or even taxi from Kirkenes is the most convenient way of reaching Murmansk. An added dark "bonus" of sorts is that the road passes close by the infamously grim mining town and smelters of Nikel. There are tour operators based in Kirkenes that can provide both transport, hotel arrangements, Russian visa support and optionally guided tours in Murmansk. Different packages are on offer, from short one-night stopovers to longer stays. Using the regular Russian minibuses that make this journey keeps the costs lower, but if you're pressed for time you may have to make the return journey by private car (taxi), which naturally costs more. Overall, these trips do not come cheap at all. The short one-night-in-Murmansk trip that my wife and I did cost 2200 NOK per person (without guiding in Murmansk, just for transport and the hotel room in Murmansk). Combinations within Norway would require either a long drive or an internal flight – the "nearest" location being Narvik, which is reachable by domestic flights via Tromsø and Bodø. The latter is a good jumping-off point for an excursion to the Blood Road Museum. Tromsø, just over an hour's flight from Kirkenes, is also the most frequently used departure point for flights to Svalbard. 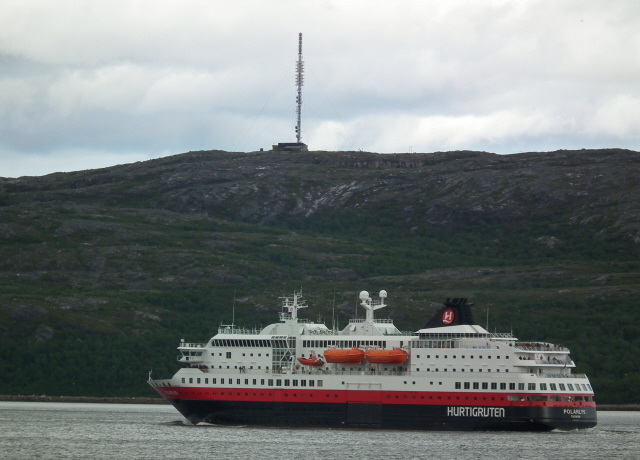 Combinations with non-dark destinations: Most tourists only get as far as Kirkenes because it is the terminus of the fabled Hurtigruten ferry service. A large proportion of those regular tourists then proceed more or less immediately to catch a plane back south to Oslo or somewhere. The few that stay overnight do only a little sightseeing or maybe go on a king crab safari. These are indeed a cool thing – and not only because of the mildly dark attraction of getting right close up to the Russian border by boat (see above). The main thing, though, are the king crabs themselves. "Safari" in this context means something other than it normally does. While in wildlife refuges such as Krüger Park in South Africa, you only watch the animals on a safari these days, and would neither shoot nor (let alone!) 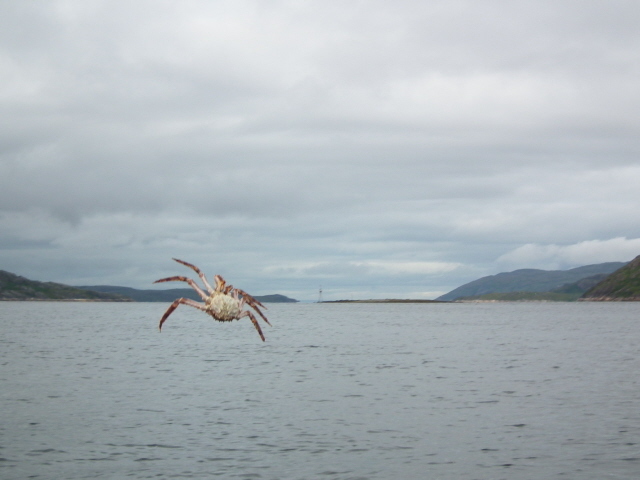 eat a lion, the king crabs in the waters around Kirkenes are caught and then eaten! It's less morally dubious than it sounds. 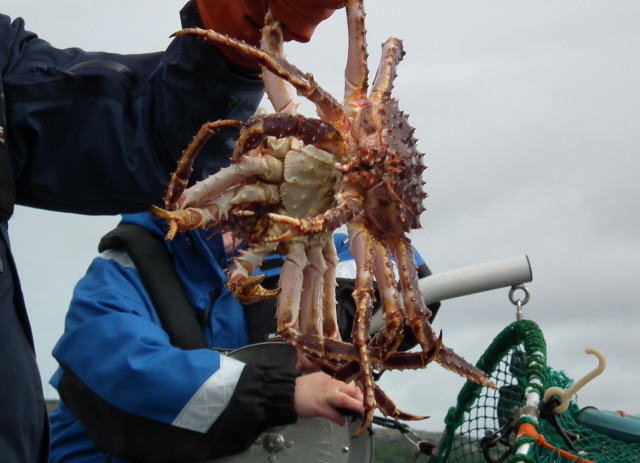 King crabs were originally brought over by the Russians from far-eastern Kamchatka and subsequently became a pest in the fjords of northern Norway, invading habitats and pushing out local species. So controlling the pest by catching and devouring these ravenous monster crustaceans is actually a good thing! And they are immensely yummy as well! For most people – well, indeed all people living neither in Kamchatka nor up here in northern Norway – king crabs are a very special seafood luxury that costs serious money at home. Even in Bergen I saw king crab legs on offer at the fish market for steep prices that were hardly less than what I'd have to pay at home (Vienna), namely 99 EUR for a kilogram. On a king crab safari you get as much of them as you can possibly stuff yourself with … and that's for crab legs that couldn't possibly be any fresher. 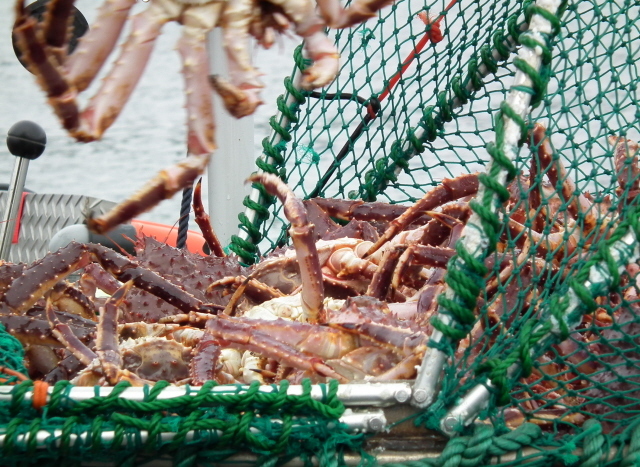 The boat first goes to some crab pots in Kirkenes Bay, the skipper hauls them out of the water and out of the tangled mass of crabs selects the biggest ones. The boat then goes to a place where they can be prepared – in the case of the tour I took it was a wooden hut on stilts by the Pasvik river just opposite Boris Gleb across the border in Russia. While the skipper/guide relayed the history of the place to the group, his assistant prepared the crabs. Then we all sat down and got our hands dirty! King crabs are well "fortified" creatures, and getting to the meat inside requires a certain effort and proper technique. The brutal way is cracking them open with a nut-cracker (provided), but that way you can easily get bits of broken shell penetrating the soft meat. If you do it right you can loosen the joints by hand and carefully pull out each segment of meat. They can be dipped in sauces or just eaten solo. They have a wonderful sweetish seafood taste, much more tender than lobster or prawns and much more delicate than other crab types. An experience! Other than king crab safaris the area offers lots for those into the great outdoors – with a bit of luck you may even spot wildlife such as reindeer, foxes or even bears. The landscape is rugged and subarctic, ranging from a rocky coastline to tundra and wide expanses of dense forest. For those with an interest in the mystique of Sami culture, the remote Pasvik region is also just the ticket, and branches of the Sør-Varanger Museum caters for this too. Ask in the tourist info in Kirkenes centre. For a few years now, Kirkenes has also had one of those ever more popular snow hotels in the winter season – and that's of course the season to go if you want to have a chance to see the Northern Lights or go on snowmobile or dog-sled excursions in the twilight of the Arctic winter.